The backstory to these cards is here. This is the first card I made for Mrs W. I started with this pretty MackIntosh-esque image and added the Papertrey sentiment and numbers. I embossed it all in gold and coloured it in with Copics and then diamond Stickles. I created a frame out of gold foil paper and cut the focal panel a bit smaller, so I could get an additional red border without an extra layer. This card is 5.5x5.5. Here's the second card, I loved it when Darnell filled in all the little dots with the starburst die for this card, so I used some red glimmer paper for some sparkle. I finished it with a Clear and Simple Stamps sentiment. This card is 5x7. Both these cards are perfect. My favourite mmmmmm probably the first with that addition of gold frame. Truly beautiful, these ladies are very lucky. Wait. Whaat? There's my name and a CASE of my card! What a wonderful surprise and a HUGE compliment, my friend!! Thank you! 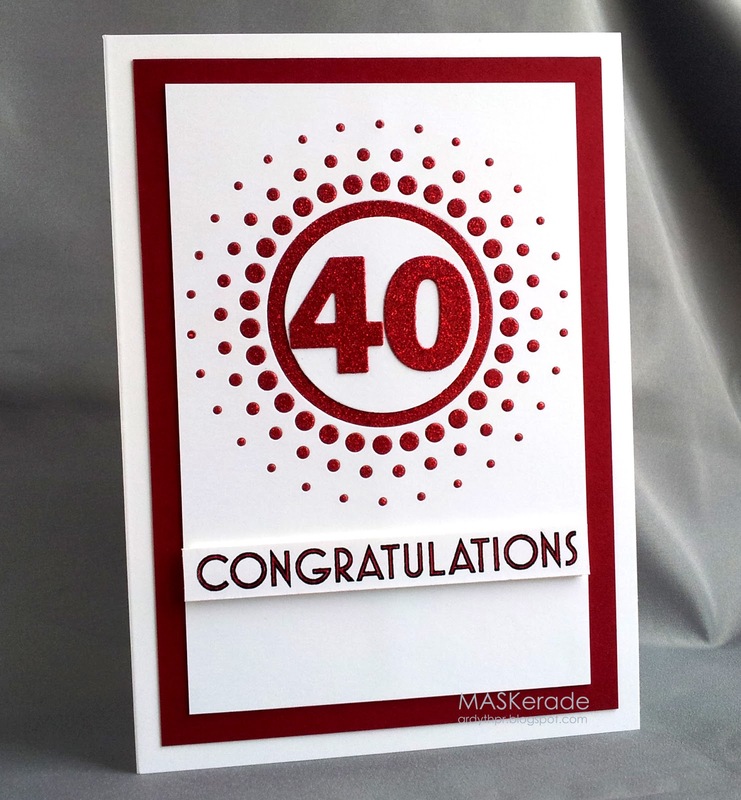 I think this just explodes as a congratulations card and I love that you used the glimmer paper!! It actually took me a few minutes to scroll down to see "my" card because your first card for Mrs. W had me mesmerized! It is the essence of richness and glam!! WOW, Ardyth! 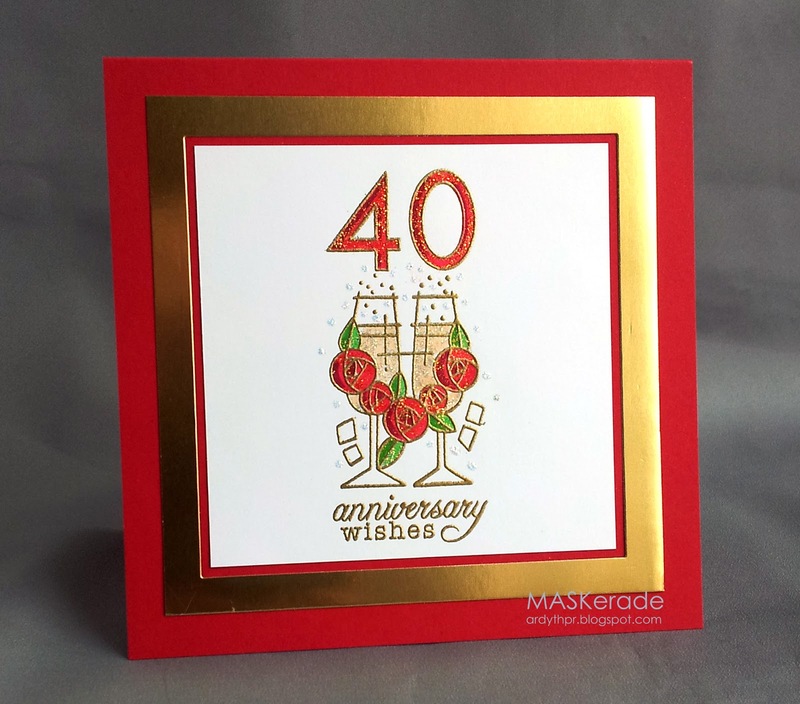 Both cards are exquisite and elegant; perfect for celebrating a 40th anniversary! The two ladies who commissioned these will be ecstatic, but nowhere near as thrilled as those who will be receiving them. Stunning and gorgeous! Wow - both these cards are just stunning! I love the elegant red and gold on the first card, and he dotty circle is just so gorgeous! Holy cow Ardyth...you outdid yourself. These cards are amazing...and yes...I say that EVERY SINGLE TIME I COME TO YOUR BLOG! The first card is absolutely stunning. The circle card is more Ardyth-ish and lovely. Oh my...what a wonderful pair of cards and I know those who receive them will be over the moon excited. Simply gorgeous! I'm definitely on board with the others..this is a fabulous stamp...and embossed, blinged and colored...perfect for an anniversary celebration! Darnell is thrilled with your CASE and rightfully so cuz this is the perfect blend of Ardyth & Darnell...hey, it's a Darnyth creation! Love them both ...that gold embossing is awesome looks so good and i think i may have to try it instead of just embossing a sentiment. ooh, I love Mackintosh designs! And they are indeed very different so no worries on which one is "better"! I'm really drawn to your use of red and gold. Your cards are gorgeous. I pinned the second one a while ago on my pinterest et and I lifted it last week . If you want to see it, it is on my blog. I linked it to yours to let people see how amazing your card is.